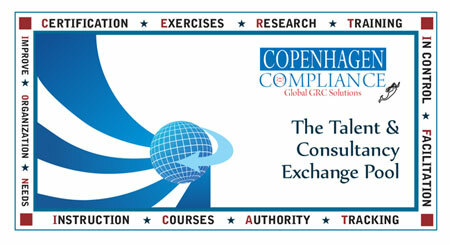 Copenhagen Compliance® Talent and Consultancy Exchange Pool. The new brand of expert Good Governance, Risk Management, Compliance, Accounting and Finance, Fraud and Corruption, CSR and other related issues are constantly evolving and transforming the world of consultancy and assignments. This change requires experienced experts, consultants and project managers that are at the forefront in designing and implementing, these unique and cutting edge solutions that to address stakeholder concerns. Since 2005 Copenhagen Compliance® has developed methodologies, roadmaps, and frameworks to combine the reflective energies of good Governance, Risk Management, Compliance and IT-Security (GRC) Bribery, Fraud, Corruption (BFC), Corporate Social Responsibility (CSR) and sustainability issues and processes, to create value and promote global excellence. Our customised GRC/BFC/CSR process, templates, prompts process integration, automation and cooperation between all stakeholders to create business significance in all GRC relationships and transactions. The outside-in component is done thru in-house workshops, conferences, seminars, training & education, certification, newsletters to promote a GRC culture within the organisation. Priority to transparency, accountability, and oversight. The primary aim of our advisory is to help companies achieve integrated GRC/BFC/CSR management that unlocks the company cultures and value. To be In-Compliance with ongoing stricter regulations and at the same time manage the global GRC impact of emerging markets by optimising GRC issues to IT-Security & automation. Copenhagen Compliance provides a global end-to-end GRC/BFC/CSR platform. The comprehensive & proven advisory and guidance for the GRC/BFC/CSR portfolio and components; include Governance, Risk Management and Compliance Intelligence, Internal Controls, Audit, CSR, Compliance & Policy Management, IT-GRC, Sustainability Management, Forensics, Bribery Fraud, Corruption (BFC), IT &- Cyber Security Issues. The global talent database of free agents, interim managers and independent consultants for Good Governance, Risk Management, Compliance, Accounting and Finance, Fraud and Corruption and: related consultants will match our clients need for experienced experts, independent consultants and interim project managers. Our experts, consultants, and project managers are cross- and double checked, referenced, controlled and documented for their expertise and experience, with a clean sheet and proven track record. Our consultants are either working for an international audit or consultancy company and are familiar with the processes and tools that are necessary to meet the demands of an ever changing landscape in the area of accounting, finance, IT, GR/BFC/CSR. Based on the client requirement and the consultant expertise our selection and matching process will assure proper assistance, appraisal, assessment on the type of project/consultant to proceed within the area of accounting, finance, IT, GRC, BFC, CSR. For one of our major international clients we are seeking a Business Controller (Nordic).